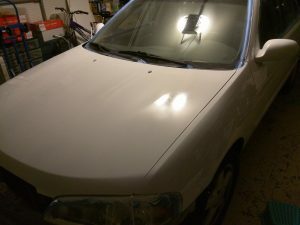 Today I spent about 4 hours after church sanding and putting on the second layer of paint. 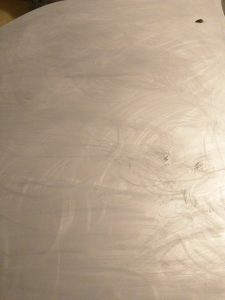 This time, I took time to sand using 400 grit, having learned from putting on the first layer. What I’ve learned is that paint don’t really stick well without enough sanding, especially on vertical pieces like the doors. Even with a good scratches from sanding it can be little frustrating, but it may have something to do with the amount of thinner I’ve added to the paint. 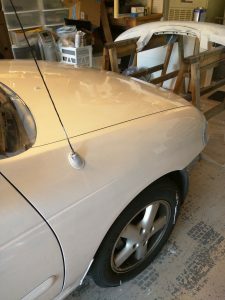 Mine was nearly 40 thinner/60 paint, which really isn’t according to many recommendations I had read, including the one on the paint can itself, which recommends little or none. Anyway, first two layers are supposed to be somewhat thin anyway, in order to speed the drying, and the last coat is supposed to be thicker. 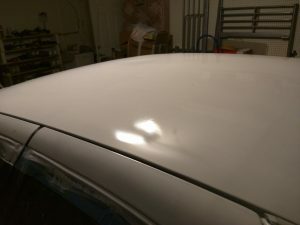 I normally don’t praise the my own work, but after putting on the second coat I had impressed myself. It started to look like a decent paint job! I’m now a firm believer in using Rust-Oleum. 😉 Of course, having done the work myself, I know all of the little inadequacies and places where there are too much paint or too little, but overall, it’s quite satisfying, albeit back-breaking. 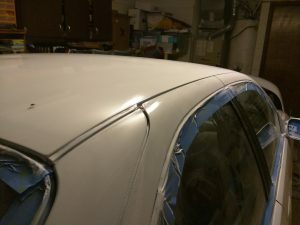 This ran into late evening hours, and I won’t get into details of little pesky bugs sticking on the paint and so on. Just use your common sense if you’re following a similar procedure. For a better comparison I should have taken some photos before the job, but I was merely thinking of blogging this as a type of record or a log. Anyway, I had to rummage through my old photos to find this one (a stitched-up panoramic version) I had taken at Taos several years back. You can see how the paint was coming off. It must’ve taken up a good half of Saturday for this. 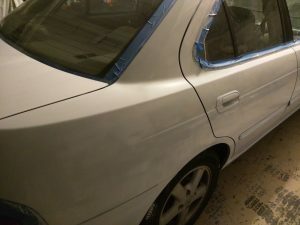 After taping and spraying the car with primer, and waiting for it to dry, I’ve applied the first layer of paint. I had no previous experience of painting using form brushes, so I was little frustrated with how things looked and I even had some places where I accidentally squeeze the form causing bubbles to appear and then even vertical drips. I’ve learned quite a bit on this first layer. 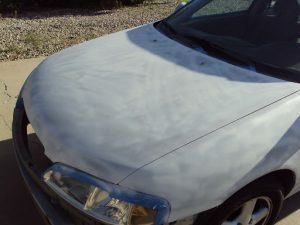 After spraying on the primer. After the first layer of the paint. 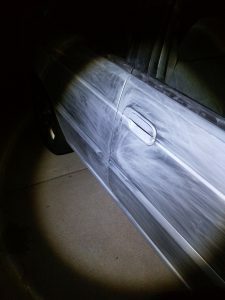 I don’t know where I had the energy, but I came home after 2 hours of kendo (tonight’s keiko intensity was similar to an hour of aerobic exercises) then I quickly jumped into my old jeans and then brought the car out of the garage to start sanding. It was already dark (8:30 pm? ), so I had to put my head-mounted light on. 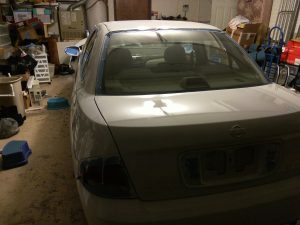 The scratches on the car was surprisingly easier to see with the flashlight. 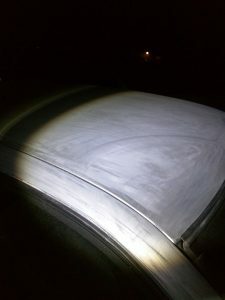 I managed to sand down the entire car. Instead of a good clean wash with water, I just wiped down the car with a good dose of mineral spirit with rags. It’s good enough. It felt like two hours had passed by, but when I checked the time, it was more like an hour and a half. I stopped only because I felt physically exhausted and hungry. I don’t remember what I had for dinner, but the pang in the stomach was starting to creep into my focus. 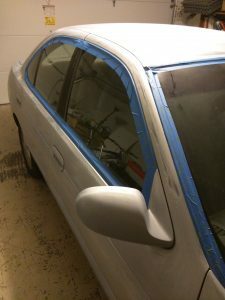 I just started taping the edges and then brought the car in. The air was cool and nice tonight. I’m sure someone striving for a perfection would easily spend several more days sanding. 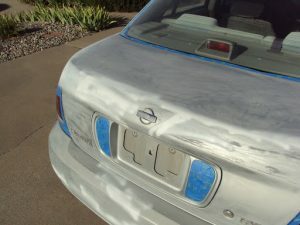 Without much time or money on hand, I’ve decided to repaint my 2002 Nissan. 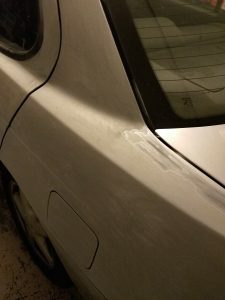 It had a Molten Silver color for its exterior according to the spec doc, but the outer paint started to peel off about 10 years ago. The paint looked fine when I moved to New Mexico nearly 7 years ago though, but, now, the peeling paint has made the car look rather shabby to others. I’m not emotionally attached to the appearance of the car I drive, so it didn’t bother me that much. In fact, I somewhat enjoy wearing and using things that has a look of being well-worn. I think my own pastor and I share a form of camaraderie for having the shabbiest looking cars at the church. Anyway, my bumper decided to give recently, and when I bought a replacement it came in its raw, black color, and it needed to be painted. 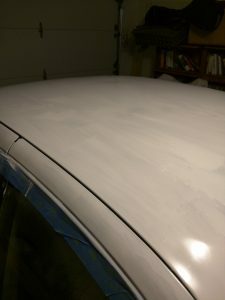 I felt that I might as well repaint the whole car while at it. 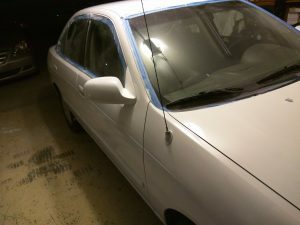 I heard from a coworker once that an excellent paint job may cost over a 1,000 bucks, and an average paint job typically costs around 300 to 500. 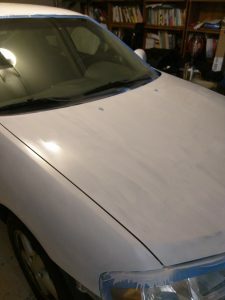 I can’t afford that kind of money at the moment, and there are other expenses that are just waiting to move out of my checking account, so I googled the Internet to find a more frugal way and most of the recent answers seem to be around the use of Rust-Oleum enamel paint. There are actually many guides and write-ups and I’m indebted to them all, especially Styluss, Craig Fitzgerald, and jtech87. 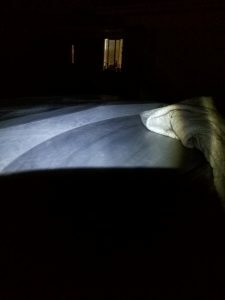 I guess this may seem like yet-another-attempt at a write-up, but this is more as a logging purpose for me to keep track of my progress. I can only allot 1 or less hour a day to this project, and usually it’s in evening. I may be able to find little more time on the weekends. Subroutine M: Wet a rag with paint thinner (100% mineral spirit) and rub down. Subroutine T: Use tack cloth to wipe the surface. Subroutine S(n): [Wet]sand with n grit paper. Subroutine W(n): Wait at least n hours. Wear a paint mask, ear plugs (or earphones if you prefer), and a goggle if you don’t want paint particles entering your system in any significant amounts. 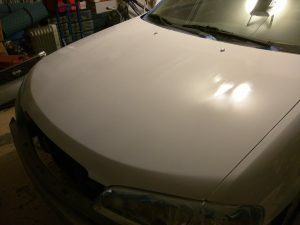 Prepare paint solution (50% Rust-Oleum Glossy White / 50% thinner) and mix it well. Do S(400) to get rid of at least 50% of the orange peel. Do M, T, P, and W(6). Repeat steps 6 and 7, and then jump to 9. Do S(800). Get at least 80% of the orange peel, but do not sand too deep. 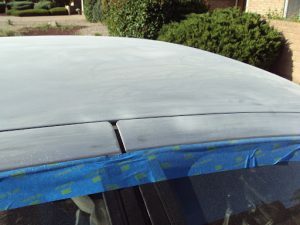 Prepare a slightly thicker paint solution (less thinner than last time). Use a new brush. 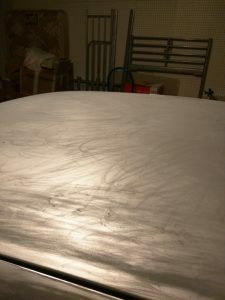 Apply 2nd clear coat (assuming you’re rotating around the car, you can start at the beginning point on step 12). I estimate about a week, but with only an hour a day, it may turn out to be longer. Anyway, here I go. With some preparation time, I ended up with only about 30 minutes of time. In a scale of 1 to 10, where 10 is a thorough job of sanding, I’d probably give myself 5 on this one. 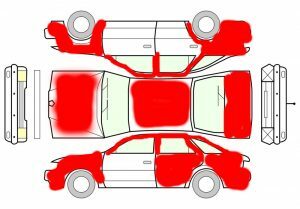 I managed to cover most of the car except for 3 doors. I imagine I may be sanding for a whole week before I put anything on. As you can see in the photo, there’s still much more sanding to do. (Yawn) I need to sleep.